You know you've hit the bigtime when you are on a stamp. 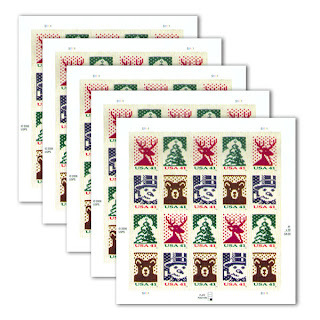 Well I did the Snoopy dance of joy when I went to my corner post office and they showed me these holiday knit stamps. Imagine being imortalized like the greats: Elvis, Madonna, and now knitting items! I bet if you blew up the image enough you could even get a neat winter pattern to follow for a stocking or some socks. So head on down to your local post office and support your knitting addiction, say it with stamps!